Last Tuesday while I was in London, I had a few hours to spare after my meeting finished and before I could catch the off-peak train back home. The meeting took place just round the corner from Tate Modern so I took the opportunity to visit Performing Sculpture, the exhibition of work by Alexander Calder that’s showing there at the moment. I’ve been keen to see it but as we missed out on visiting London in January, opting to go walking up in Cumbria instead, I was pleased to be able to grab the opportunity. 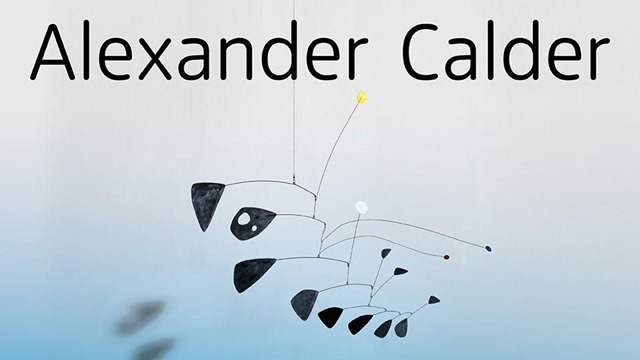 Calder was a sculptor of “kinetic sculpture” and is best known as the inventor of the “mobile”(a name coined by Marcel Duchamp when he first saw one of the sculptures). Delicately balanced sculptures constructed of wire and metal. As is usual with Tate Modern’s exhibitions it was a very comprehensive retrospective covering the evolution of Calder’s work. No photos allowed, so pictures are sourced from the Tate’s exhibition website. 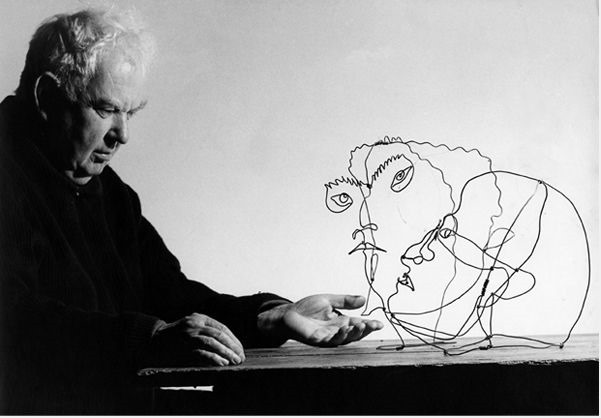 Calder was also a master of wire sculptures. He expertly bent wire to create three dimensional ‘drawings in space’. Animals, circus performers and even portraits of friends, fellow artists such as Miro and Cocteau and other well known people like Josephine Baker. I wasn’t aware of this aspect of his work and was fascinated by the works on display in two of the rooms at the beginning of the exhibition. Despite being constructed of wire which defined an empty volume, they almost seemed solid. Early in his career he visited the Paris studio of Piet Mondrian (we’d seen a reproduction of the studio at the Mondrian exhibition in Liverpool 18 months ago) and this experience inspired him to the extent that he was “converted” to abstract art. Seeing the coloured rectangles pinned to the wall he suggested that it would be interesting to make them move about. Mondrian clearly thought this was a stupid idea but Calder went away and started experimenting with creating abstract works that moved, driven with motors. There were examples of these “stabiles” – pieces that were anchored to the floor or other horizontal pieces in several of the following rooms. I particularly liked those works inspired by the planets and constellations, such as A Universe a motorised work, in which a complex pattern is traced by two spheres, moving at different speeds along the looping wire paths. The culmination of the exhibition were the final three rooms which featured his mobiles, delicate structures hanging from the ceiling. I was fascinated by how he had been able to balance them. A process which would require a good understanding of mechanics, carefully balancing the metal elements by calculating “moments of force”, a combination of the mass of the elements and the length of the wires. 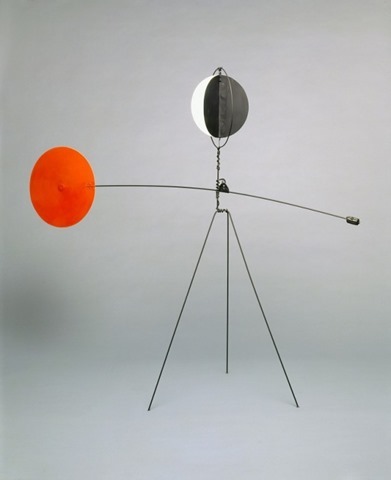 So it wasn’t a surprise to learn that Calder trained as a mechanical engineer at the Stevens Institute of Technology in his early twenties, only becoming an artist a few years after he’d graduated. There was only one work in the final room, but what a work it was. Black Widow, a 3.5 metre mobile suspended from the ceiling. The sculpture belongs to the Institute of Architects of Brazil in São Paulo. Usually hanging in a central space in the Institute’s headquarters, this is the first time it has been allowed out on loan. 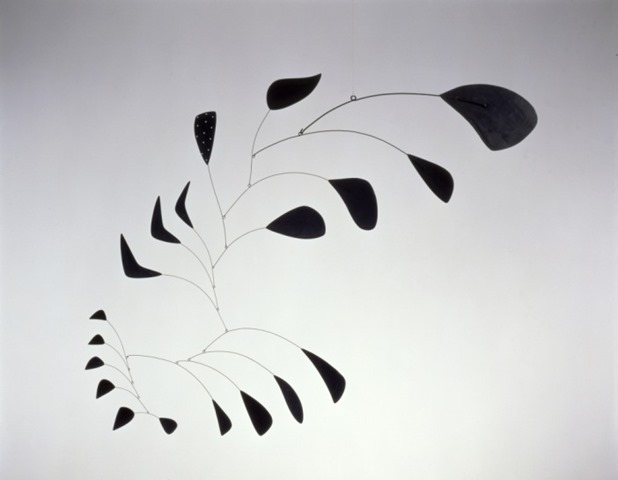 Calder’s mobiles and stabiles were designed as kinetic works. They are meant to move. So it was disappointing that there was very little movement in the exhibition, despite the video on the Tate website showing one of the mobiles slowly pirouetting in the breeze as Calder intended. The works are delicate and many of those meant to be driven by motors are too old and delicate to allow them to be operated. That’s understandable. But there was also very little movement with the mobiles suspended from the ceiling. They swayed gently, but there were strict instructions not to touch them or blow at them. Given that the whole point of these works is that they are meant to move, this was disappointing. The “Performing Art” didn’t perform. The mobiles were largely immobile. However, despite this I have to say that this was an excellent exhibition. Some beautiful works – particularly the wire sculptures, astronomical works and, best of all, the mobiles. 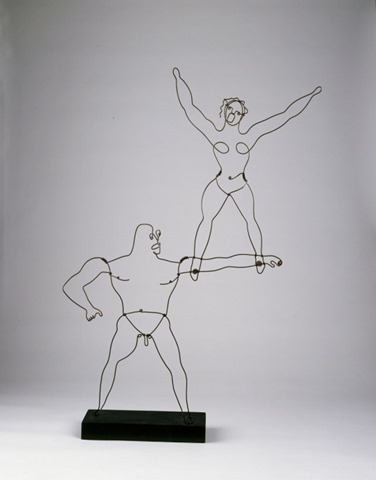 This entry was posted in Art, sculpture and tagged Alexander Calder, Art, Kinetic sculpture, London, modern art, Performing Sculpture, sculpture, Tate Modern by ms6282. Bookmark the permalink. Hadn’t heard of him before – interesting connection between art and engineering. Thanks for sharing this exhibition. Just north of Copenhagen in Denmark, the Louisiana Museum of Art has an Alexander Calder piece looking out over the Baltic Sea. It’s quite beautiful! Wow, Ketty, that’s amazing (an overused word these days but definitely applicable here!) Thanks for the link.